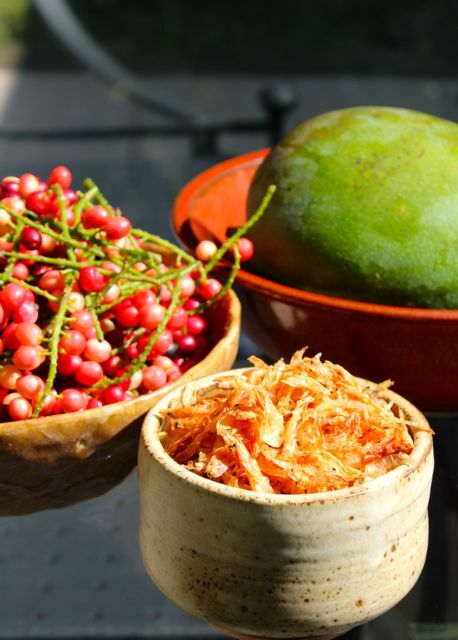 Dried shrimp exoskeletons, unbelievably tart bignay fruit and ginormous but rather tasteless “California” mangoes. Those were the more unusual things in my market basket(s) on Saturday, along with all the normal stuff like onions, carrots, kangkong, beans garlic (yes, the prices have FINALLY dropped a bit to PHP180 a kilo from 330!). I thought this ambulant vendor at the market was selling dried hibe or shrimp, but on closer inspection it looked like these were tiny shrimp shells, with no meat at all. After several questions and answers that didn’t seem to compute, we figured these must be exoskeletons of molted shrimp, sometimes found en mass when huge schools of shrimp get together to spawn. I had to look that up, as I wasn’t sure if shrimp were social (turns out they aren’t, and are often solitary creatures), if a group of them was called a school (which it seems they are, though they aren’t fish) and I never got too far to find out why they get together and spawn and molt as a group (maybe protection in numbers? )… At any rate, we were told these shells were good for flavoring dishes, including them in the sauté of garlic, onion, pork and shrimp for vegetables, for example. I bought them just because I have never noticed them before. PHP50 for a small pack of shrimp shells. Oh, but isn’t it odd how their black eyes molt as well? Or are those just the covering of their eyeballs? A huge pile of fresh bignay was on offer as well, and I wasn’t sure if I had done a post on them before, so I bought a pack for PHP25. They are almost inedible in this state, sour and mouth puckering in a seriously unpleasant kind of way. I was thinking of trying them in a cranberry type sauce with sugar and perhaps citrus juice… but I haven’t gotten around to that yet. My old post on bignay, here. Obscenely large. Several of the crew thought it was a papaya. And even I took a second look. At PHP70 a kilo, how could I not try one, and at 1.3 kilos in weight it cost PHP90. We peeled it when still a bit firm, and the flesh was still a bit hard, but it lacked flavor… The lady selling them said they were called “California” mangoes and of course I can’t find any reference to them with simple googling. Suffice it to say they look like they are on steroids, and probably taste like something grown on steroids. I might give them one more go and let the fruit ripen a few days more… perhaps they getter better when fully ripened. I’ve seen those huge mangoes in Carrefours Singapore years ago. As you say, more like papaya than mangoes. I’ll be interested to find out if anyone can shed light on their origin, because I’ve never seen them anywhere else. I’m surprised you did not run into bignay much earlier as they are mentioned as particularly abundant in Nasugbu. You know the expression the darker the berry the sweeter the juice, well, it is true with bignay only to a certain point, its darkest berries are just slightly less tart. The long list of its potential beneficial health effects makes it out as almost panacean. 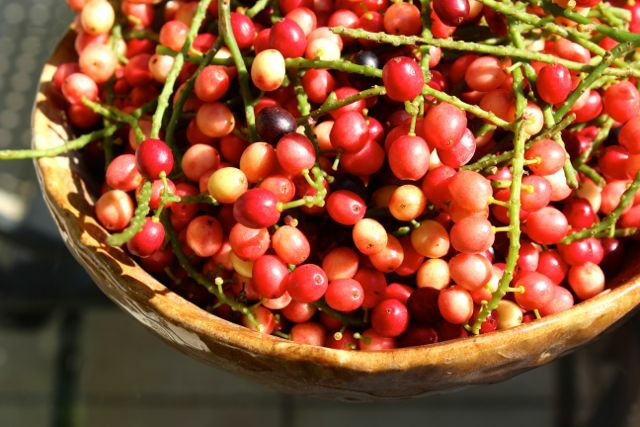 There is a similar tasting fruit in Latin America called acerola that is added to common limeade for colour and flavouring, maybe bignay can fill an identical role there but as wine? No, I think not. Shrimps maybe solitary creatures in their youth but come old age, they probably become gregarious when casting off their integument, just like the old men in the locker room of my club. 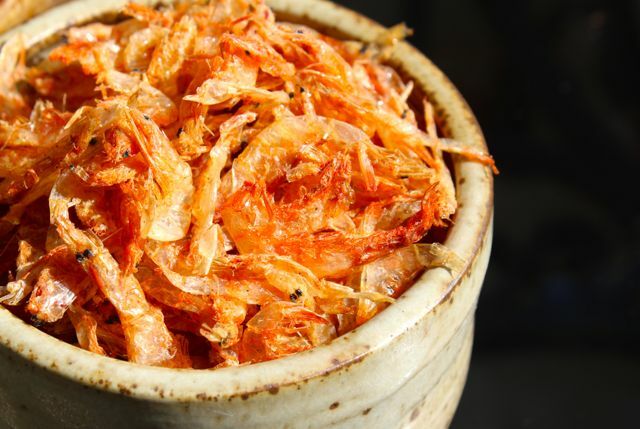 The dried shrimps is very common among Ilocanos. Because they are dried they have a longer shelf life and is added to dinengdeng. I like them in torta with some green onions. I wonder if the powdered dried shrimp shells I bought recently is the same as your purchase. I was thingking of using them for Pancit a Malabon sauce, but afraid that it might be gritty. As for the mango, a cooperative nursery in our town in Quezon yields this type of mango, but locals can’t sell it in the market, they said it’s for export only. Seeds were given to them during the Marcos era. When ripe, still taste bland. I think they are dried alamang, not shrimp molts. They were tiny and thus looked like only shells were left after drying. We call them Florida mangoes back here in Iloilo. I have a friend who used to give me those giants. It takes days (mine took a week) to ripen and the fibers are scary! Ripe or unripe, it lacks flavor though. Insects and crustaceans with exoskeletons molt everything! Including eye caps. Snakes do too! Galing no! What’s the difference between an exoskeleton and an endoskeleton? The first goes CRUNCH then SQUISH, the other goes SQUISH then CRUNCH! Coincidentally, my yaya just brought home some bugnay today that she foraged from the wilds of lipa :) tart and sarap! She makes a tea with the leaves. Found out what it was from your old post that you linked. So, have you tried aratilis yet? Mango is probably a Taiwanese king mango. As for the dried shrimp, roughly grind them and add into a thin rice flour type batter. Deep-fry to a hard crisp and crumble over noodles or add into fresh lumpia for crunch. Those shrimp look super interesting…Love flavoring dishes with dried shrimp! Have you tried them yet? joey, I haven’t, but I was thinking a quick dry or oil stir-fry and using them as a crunchy garnish to say a shrimp dish, or on top of shrimp fried rice… knew, thanks for those suggestions, I like. Isa, yes, it turns out there are aratiles trees on our property in Cebu! There are several imported varieties of mangoes that yield big fruits. I actually planted a couple of the Australian R2E2 trees here in QC, and I was able to get 30+ pieces from the 5 year old tree last year, although this year was a big fat zero. Mind you I don’t know what I’m doing, just adding some fertilizer rather haphazardly as I go along. The fruit though was very good. try fried rice on those gorgeous shrimp. I think that’s the Kent variety of mango, one of the parent strains of the R2E2 mango that I planted. I’ve tried these before but I do prefer the R2E2 or Peach Mango as it is sometimes known locally. Try the Taiwanese Golden Queen which is also quite good. They’re sometimes sold in the Rockwell mall weekend market, although it’s much cheaper to buy it elsewhere. My mil brings that dried shrimp for me from the PI quite often. My mom prepares it by adding a little salt, tomatoes and onions. Wash it well because you will find tiny small rocks, dried grass, and other creatures in there. When cleaning it I put the dried shrimps on a white plate and literally look through the whole thing little by little because who wants to bite into tiny rocks! Then rinse it well a couple times and gently squeeze the excess water. As other readers have mentioned, those little shrimps are made into torta and dinengdeng as well, but I prefer it cold with tomatoes and onions. By the way, I really enjoyed your African adventure. Thanks for sharing. 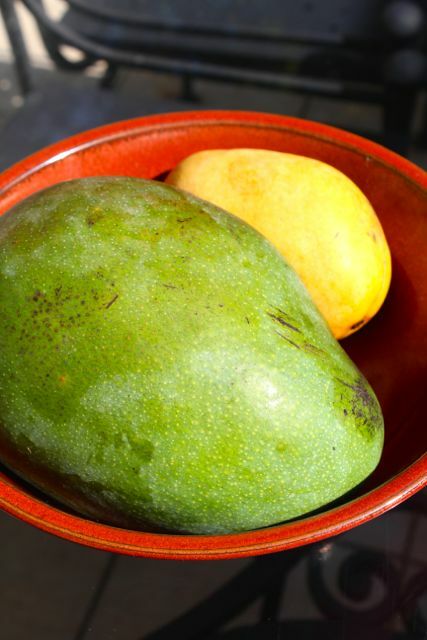 Those mangoes are best eaten when green, with bagoong.. Like appetizers.. I miss bignay. I think Monty is right. That’s a kent mango. they are not good. like what EbbaMyra and Honey Blush said, they are bland. Ripe or not. I seriously doubt if those are really “California” mangos. Here in California, these local mangos are called California Keitt mangos and those I’ve seen each has a sticker that says “California Green Mango” or “Product of USA” and the two largest, if not the only commercial growers are in the Coachella Valley. Imported mangoes go through a hot water soaking which is required by the USDA to eliminate any fruit fly larvae. This procedure is one of the main reasons why imported mangoes are not tree-ripened. California Keitt mangos are ripened on the tree. The season for California Keitt mangos is only from September to October. Against the mangoes from Latin America, California Keitt mangos are less stringy. Typically priced at $2.00 to $3.00 each. I can’t help but wonder though, why would the Philippines import mangoes from the US? That’s like the candymaker buying candies from the trick-or-treaters. Bugnay…brings back childhood memories in Cebu! …i remember eating from a small plastic bag with rock (sea) salt…shaken to spread the salt evenly. The bignay looks like currants,Mm. Hi MM, I think it’s golden queen from Taiwan. I did try the ripe one before here in singapore. It’s still bland. lol. Mangoes on steriods. You made my day Mr. MM! You’re right, there is no mention in your post that they are imported from California, but the vendor claiming they are California mangos naturally would infer that they are from California. I apologise for misunderstanding. Perhaps they are grown from the Keitt variety. Any leads on dayap seedlings here in Manila? Hello guyz.. can i ask question??? how much per kilo of Mango PICO??? Marketmanila T-shirt & Tote Pick-up at S&R Fort Bonifacio This Saturday!! !